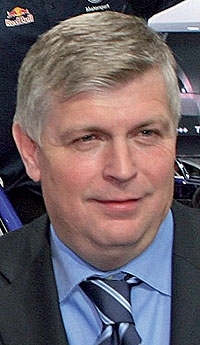 Volkswagens Wolfgang Hatz: Hybrid version of the Audi Q5 will compete with rivals from Lexus, BMW and Mercedes. DETROIT— Audi will offer a hybrid version of its Q5 crossover in the United States starting in late 2010, says Wolfgang Hatz, head of powertrain development for the Volkswagen group. In an interview last week at the auto show, Hatz said Audi must offer a hybrid model to compete with rival vehicles that already offer the technology, such as the Lexus RX 400h. The BMW X6 will be offered as a hybrid late this year, and Mercedes plans to roll out a hybrid in each of its major models starting with the S400 hybrid this year. But Hatz said he thinks the greatest potential lies in diesel. "If you look at what you have to spend to get the advantage of the hybrid and what you have to spend on other technologies like diesel, the diesel is much more cost-effective," Hatz said. "We have to do hybrids in order to show people that we are able to do them." Hatz said the cost to develop a hybrid powertrain is three to four times greater than that for a standard drivetrain, compared with less than 50 percent greater for a diesel drivetrain. Considering the low volumes of hybrid vehicles, it makes for a "negative business case" to offer the drivetrain in one model only, Hatz said. "At the moment, we have to spend quite a lot on the basic technology, which then we can perhaps spread later on more models," he said. Audi had planned to offer its first hybrid in the larger Q7 crossover, but the dollar's weak value against the euro made the business case unworkable. Hatz said the Q5 was a natural alternative. Already on sale in Europe, the gasoline version of the Q5 reaches U.S. shores in March. It will compete with the BMW X3, Mercedes-Benz GLK and Volvo XC60.